Creative considering support for Linux. About a month ago I wrote to Creative Labs, whose products I’ve been using for more than a decade regarding their arguable support for OSS and more specifically linux. Their response to my comments, although lukewarm, assured me that Creative is serious about supporting OSS, and is contemplating ways in which is can step up its efforts. Currently, Creative Labs support for OSS is quite limited, as specifications for all Audigy cards are only provided under NDAs, the Creative originating EMU10K1 driver provides only basic support for those cards and – to my knowledge – the only effective support that the community is getting from Creative is in the form of card donations once in a while. An approach similar to nVidia’s closed source drivers seems appropriate if Creative products are to see any use in OSS systems. I guess that is what Creative will (hopefully) present in 2005. Along with drivers, additional support for Alsa’s suite of applications is sorely needed. Currently there exists no GUI mixer application for either KDE or Gnome with a high quality of service. Creative could easily help there – they’ve got the experience and most probably the resources, judging by the over-the-top applications their provide for Windows. A critique on modern GUI design. Don Norman, a usability design specialist, writes about how the GUI has become a very complex part of modern programs and argues that the general-purpose computer is now inappropriate, as the GUI paradigm as we know it is incapable of efficiently encapsulating all the information we require for our daily work. I disagree. I believe this kind of approach is the easy way out. An excuse for the incapability of the IT industry to innovate, instead of perpetuating the milking of the modern society’s dependence on computing machinery through sub-par products. True, the ‘classic’, 30 year-old GUI paradigms we’ve been using in commercial products since the Apple Lisa and the Macintosh, and much later Windows, is dated. And, true, it is completely inefficient when we’re talking thousands of files, hundreds of programs and thousands of relationships, interconnections and interactions between them. But, surely, this challenge can better be solved through innovation, through revolutionary design and not by building specific-purpose computers. The latter would certainly satisfy Microsoft, where Mr. Norman works, as it would have to just sit back and continue seeing its funds increase, as people would require more and more specific-purpose computers in their daily lives, all without raising a finger. I guess companies like Microsoft – and to some extent Apple – are locked into their existing systems, their existing platforms and their existing functionality, in the same way users of their systems are locked into the commercial software they depend on and have invested in. 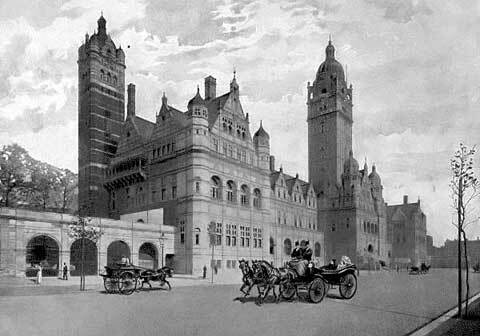 Once upon a time, in the place of the ‘South Kensington Campus of Imperial College London’ stood an architectural masterpiece known as ‘The Imperial Institute’. A small, yet quite revealing, sample of that work still remains in the form of the 85 metre Queen’s Tower, rising high above the ‘backyard’ of Imperial College, currently a campus characterised by cheap construction, lack of æsthetics and lots of concrete, steel and glass, and an increasingly annoying corporate identity. I have been following Dave Hyatt’s work (and blog) for a few years now and I have to admit that I am very happy to see people like him and Dominic Giampaolo and Avie Tevanian work for Apple. One of the my long-time grudges with Apple strategy is that there seems to be none. Despite phenomenal products Apple does not seem to grasp the importance of essence in its marketing campaigns as well as its R&D processes. Many people have talked about how today’s Apple provides ‘instant satisfaction’, ‘high impact’ experiences to its customers/users, whilst, for the most part, fails to provide adequate support or show the required respect to its customers post-purchase leaving many people perpetually oscillating between being annoyed by Apple’s disrespect for their custom/having a considerable investment in their products/wanting out and getting very excited for a short period after Steve Jobs presents something new in some event/resorting to zealotry to support the platform etc. The same thing can be said about Apple’s stance towards developers: Apple, for better or worse, promised a lot with OS X and has failed to live up to its promise. Not in terms of the existing software, but in terms of the long-term strategy based on which a customer (be it an individual or corporation) would invest in its products. You are currently browsing the cosmix.org weblog archives for the year 2004.